This male bird was photographed in Chiricahua National Monument in southern Arizona. We were excited to see a family of quail on the side of Lookout Mountain. 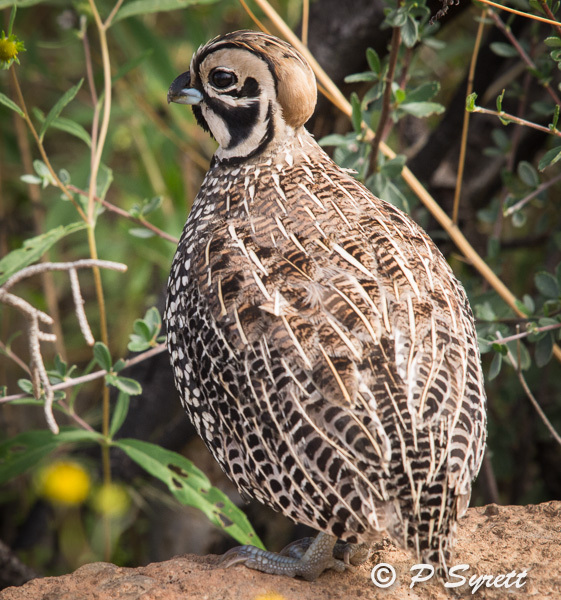 Montezuma quail has a very limited range in the USA: in parts of southern Arizona, southern New Mexico and western Texas. This secretive quail is declining in numbers, possibly because it is very sensitive to overgrazing. It feeds on bulbs and tubers growing underground, in dense grassland and scrub country at higher elevations. Because the bulbs provide a source of moisture, even in dry conditions, this quail is not dependent on free water so occupies arid habitats. However, it appears to need summer rains as a cue for breeding. 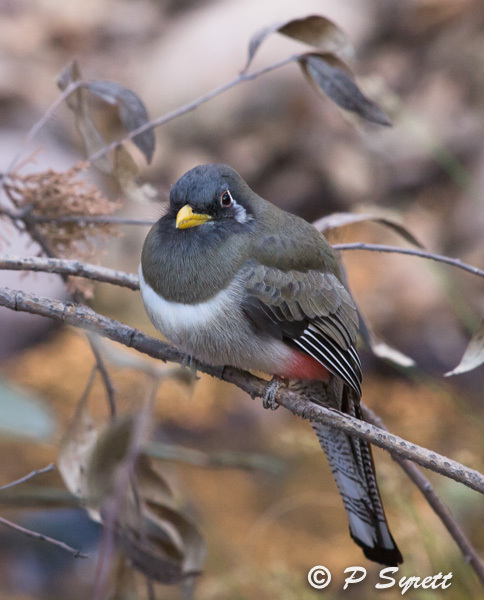 The elegant trogon occurs in very limited areas of southern Arizona, in canyons of oak and sycamore. This female bird was photographed in Cave Creek, in southern Arizona. I was very pleased to see it early one morning, as it flew towards us. Females are less easy to spot than the male birds, which have a characteristic call. The male bird is colourful, with a bright orange-red breast and metallic dark green head. Elegant trogons that breed in Arizona migrate to Mexico for the winter. Although the elegant trogon has a very limited distribution in the USA, it is relatively common in Mexico and as far south as Costa Rica. Very interesting Pol. I'm even more keen to explore western US than ever. I have a large garden in the suburbs of Christchurch, New Zealand, which is the main focus of my photography when I am not travelling. I love camping and hiking here and overseas, especially in the deserts and mountains of western North America.